Background: Metabotropic glutamate could contribute to the development of neuropathic pain-related behaviors. Previously, we have confirmed that the glutamic acid and dizocilpine maleate in the hippocampal CA3 region are involved in the modulation of noxious stimulation. However, whether the metabotropic glutamate receptor 7 (mGluR7) can modulate the pain-evoked electrical activities of pain-excited neurons and pain-inhibited neurons in the hippocampal CA3 region is not clear. Objective: The study aimed to examine the effects of mGluR7 allosteric agonist N,N'-dibenzhydrylethane- 1,2-diamine dihydrochloride (AMN082) and antagonist 6-(4-methoxyphenyl)-5-methyl-3- pyridin-4-ylisoxazolo[4,5-c]pyridin-4(5H)-one (MMPIP) on the pain-evoked electrical activities of pain-excited neurons and pain-inhibited neurons in the CA3 region of rats. Method: A train of electric impulses applied to the sciatic nerve were used for noxious stimulation. 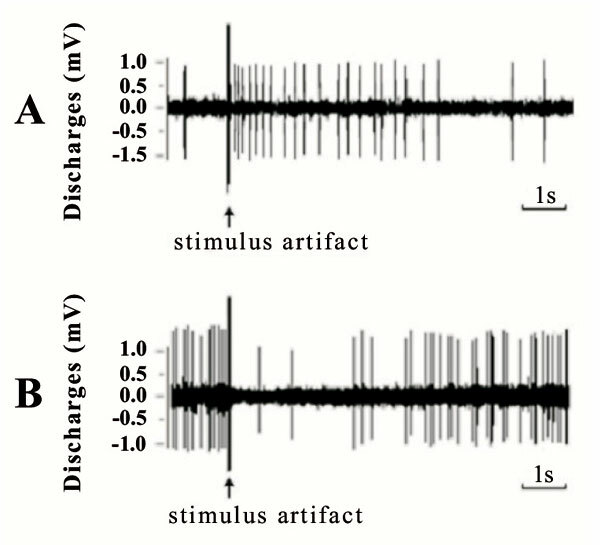 The bio-electrical activities of pain-excited neuron or pain-inhibited neuron in the CA3 region were recorded by a glass microelectrode. Results: Our results exhibited that intra-CA3 region administration of the glutamic acid or AMN082 increased the pain-evoked discharged frequency and shortened the latency of pain-excited neuron, while decreased the pain-evoked discharged frequency and prolonged the inhibitory duration of paininhibited neuron in the CA3 region. The intra-CA3 region microinjection of MMPIP produced the opposite response. Conclusion: These findings demonstrated that the glutamic acid and mGluR7 in hippocampal CA3 region are involved in the modulation of nociceptive information transmission by regulating pain-evoked electric activities of pain-excited neurons and pain-inhibited neurons. Metabotropic glutamate receptor 7, N, N&apos;-dibenzhydryl-ethane-1, 2-diamine dihydrochloride, 6-(4-methoxyphenyl)- 5-methyl-3-pyridin-4-ylisoxazolo[4, 5-c]pyridin-4(5H)-one, Hippocampal CA3 region, Electrophysiology, Algesia modulation.